This weekend, for the first time ever, I will be taking to the skies with Rose in Thorns, and bringing my wares to Auckland. 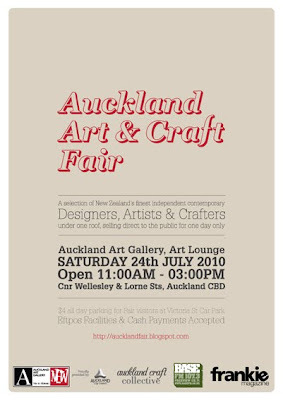 I'm excited to be involved the inaugural Auckland Art and Craft Fair, along with a very talented selection of New Zealand crafters and designers. The Fair is designed to showcase these artists, whose products have an emphasis on quality, craftmanship, creativity and style. You can purchase direct from the seller, knowing that you are supporting New Zealand talent and you will be taking home a special piece that has soul. It is being held in the Art Lounge at the Auckland Art Gallery. Why not make a day of it, you can check some of the exhibitions at the Gallery, take a stroll around Albert Park, and have lunch at the cafe. There will be eftpos facilities available, where you can withdraw special market money which has been designed by illustrator Sarah McNeil. There will be $4 parking available for visitors to the Fair that use the Victoria Street Car Park, with a special discount voucher from the gallery. 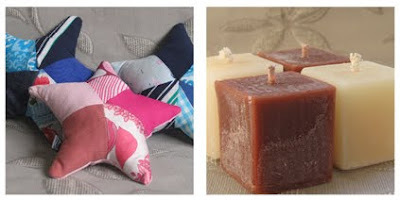 I will be bringing my selection of recycled wax candles, including mini-teardrops and hand-dipped tapers, as well as my new range of soy tin and tealight candles. There will also be some recycled cassette tape purses, and if I can squeeze them in, some of the first of my range of soft toys, starfish rattles. You can bring along any old candles you would like to be recycled, and in return receive a 10% discount off your purchase on the day. If you come along to the Fair, do say hi, I like to meet lovely blog readers. That's come around quickly huh?! Good luck up there in the big smoke - I'm sure you'll do well. Kinda wishing I was going too now... should be a blast!